DESCRIPTION: IBM DB2 for Linux, UNIX and Windows (includes DB2 Connect Server) could allow a local db2 instance owner to obtain root access by exploiting a symbolic link attack to read/write/corrupt a file that they originally did not have permission to access. DESCRIPTION: IBM DB2 for Linux, UNIX and Windows (includes DB2 Connect Server) could allow a local user to obtain root access by exploiting a symbolic link attack to read/write/corrupt a file that they originally did not have permission to access. 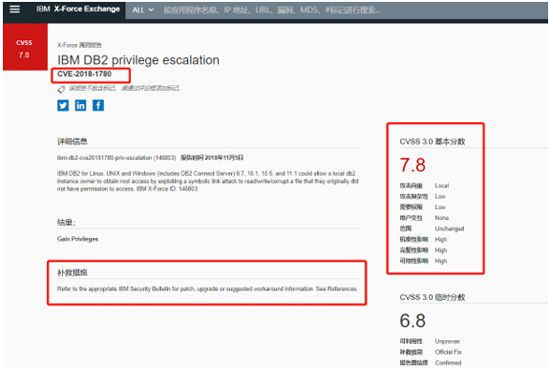 DESCRIPTION: IBM DB2 for Linux, UNIX and Windows (includes DB2 Connect Server) contains a vulnerability that could allow a local user to escalate their privileges to root through a symbolic link attack. DESCRIPTION: IBM DB2 could allow a local unprivileged user to overwrite files on the system which could cause damage to the database.